I am honored to be the keynote speaker at this year’s National Sales Network (NSN) conference in NYC! 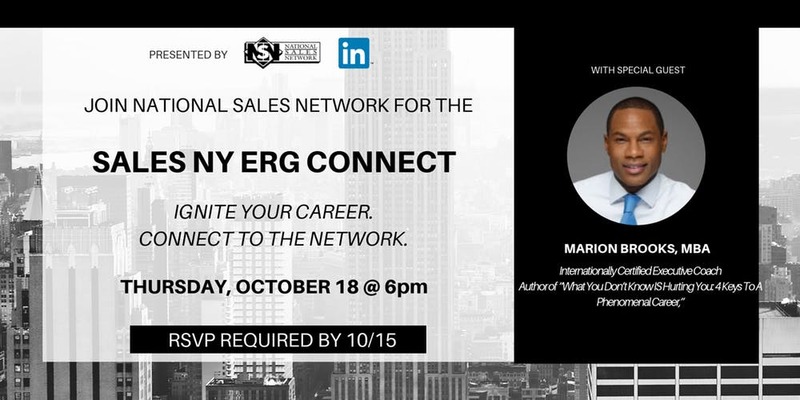 This annual event takes place at LinkedIN’s Empire State building office on Thursday, October 18th from 6 -10 pm. Every year the NSN conducts an annual conference & career fair where people can engage with top world sales leaders and over 45 companies. During this event, I will be talking about my new book “What You Don’t Know Is Hurting You – 4 Keys to a Phenomenal Career”. I will also be providing practical, actionable insights on how to be and how to develop dynamic, effective leaders. I am excited to announce a special chance for people to attend the conference. You will get the opportunity to meet with over 1,400 sales professionals and leave with world-class sales training and development. Food and drinks are included with your ticket. Leadership is a vital skill set in this competitive global economy and I cannot wait to share with you the key to success. RSVP now – spots will fill up quickly!